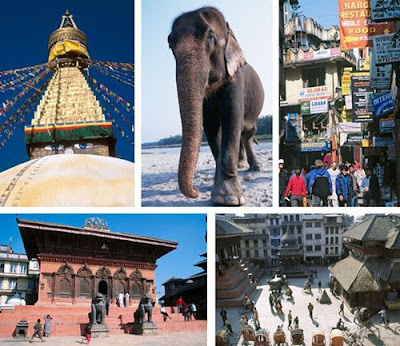 Nepal was still a kingdom when I traveled there a few years back. I can still remember clearly when I took each of these photographs. The one of the elephant was taken after it was done taking a mid-day bath in the river in Royal Chitwan National Park . I was lying on my back on the ground and rolled out of the way just in time. From the top (clockwise) Bodhnath Stupa; Royal Chitwan National Park; Thamel, Kathmandu; Durbar Square, Kathmandu and Shiva Parvati Temple, Durbar Square. These have appeared in publications including consumer magazines and national newspapers. That was a near miss with the elephant but it made for a great photo. Nepal is another home I had in my childhood...well, 'almost' home, in that we spent a lot of time there when we lived in India. So I loved this post! Scary about the elephant though....they are such big animals! I moved my blog today, back to Blogger, and mentioned you in my post :) Go take a look! These are some really inspiring pics! That elephant situation makes me think that a photographer's job can be really risky. How many times have you been in danger like that? Heather and Lakshmi, Thank you. Hobo, You must visit one of these days. Bella, what wonderful experiences you had as a child. Fly Girl, I don't ever put myself in danger intentionally. I was trying to get a good angle and the elephant changed paths quickly. Ivana, Thank you and will stop by your blog.